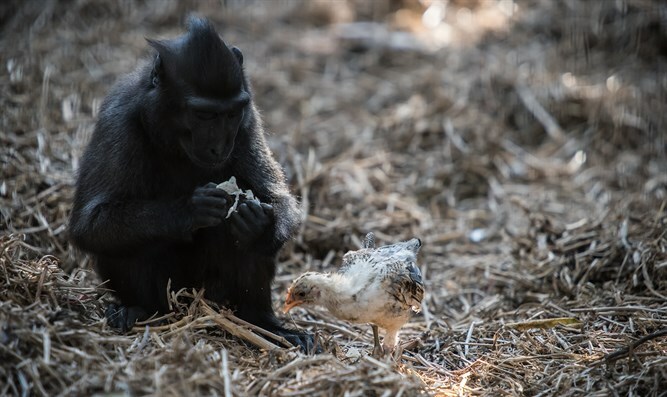 Endangered macaque adopts takes care of chicken at Ramat Gan Safari, zookeepers stumped as to chicken's origin. "It seems that Niv, who is four years old and has reached maturity, is having difficulty finding a partner," the zoo's spokeswoman Mor Porat said. "This probably explains the maternal instinct she expresses to this chicken." To avoid such a tragic end, officials separated Niv and her feathered companion from the other macaques - apart from her mother, who is often the target of hostilities from other females. The black macaque is listed as critically endangered by the International Union for the Conservation of Nature. Meanwhile, the domesticated chicken is the most common bird in the world.